FlowCam services are provided world-wide. 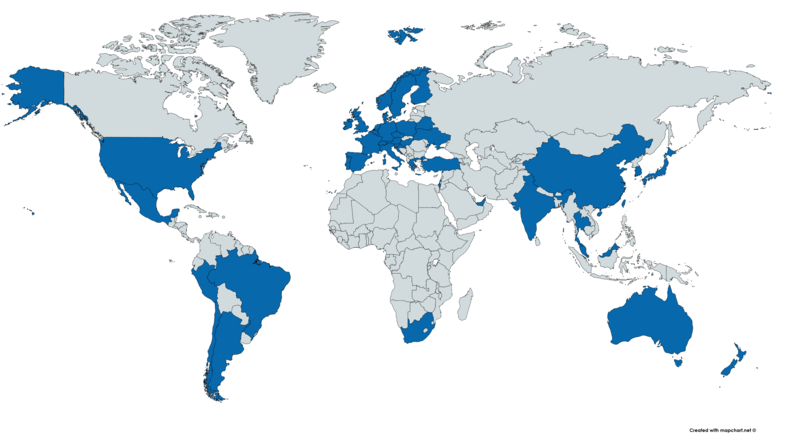 Countries with technically trained FlowCam sales, support and service representatives are highlighted in blue. The Technical Customer Support team at Fluid Imaging Technologies travels world-wide to provide training and support to FlowCam users. In addition to our in-house services, Fluid Imaging Technologies also partners with technical experts in 20+ countries to train and support FlowCam users locally. Some are dealer representatives while others are factory-trained to provide a full suite of services. We are proud to provide regional services to eliminate language barriers and provide local, economical services to our global user-community. Examples of local services that may be available include: training, IQ/OQ, preventative maintenance, upgrades and repairs. Note that specific servicing capabilities may vary location to location. For 2018, Fluid Imaging Technologies is partnered with representatives in the following countries/territories. Please note that regardless of where you are located, we will utilize our existing partnerships with local technical experts, establish new ones, or service you directly to deliver the best FlowCam experience to you and ensure that you receive the highest quality service, training, and materials. If you are in need of FlowCam services or support, there may be a representative near you who can help. Contact us to learn more and to schedule these services.